Members of the Society of St John the Evangelist are again offering their creative Advent devotional project, AdventWord. 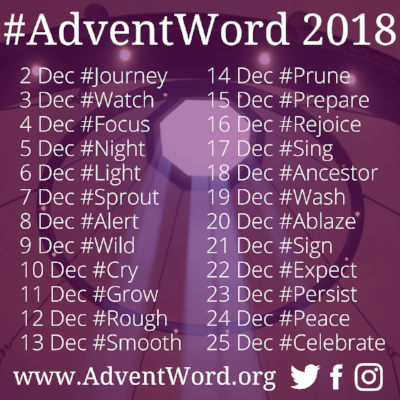 Participants are invited to receive a word each day during Advent by email and then to respond to the word using the hashtag #AdventWord on social media to create a Global Advent Calendar. #AdventWord begins on Sunday, December 2 with images and meditations available via email, Facebook, Instagram and Twitter. During the 23 days of Advent, a daily email featuring the #AdventWord of the day will go out at 5 a.m. each day, and respondents are encouraged to share their responses to the meditations and images to the aggregated prayer walls within the advent calendar. #AdventWord helps teach every one how to pray with images as we prepare for the coming of Emmanuel. The monks of SSJE developed #AdventWord to bring joy and have passed it on to Virginia Theological Seminary to work with Anglican Communion Office and we are excited to see #AdventWord being offered to a wider world. Please click here to receive your daily #AdventWord meditation, and select the language in which you would like to participate. We truly look forward to having you join us for #AdventWord 2018 in this holy and joy-filled season.